Hinshaw, Earl, head-of-household, age 26, born in Indiana; parents born in Indiana; rented home; occupation: farmer, farm. Hinshaw, Clara H., wife, age 25, born in Indiana; father born in Ohio; mother born in Indiana. Hinshaw, Francis I., daughter, age 4 years 5 months, born in Indiana; parents born in Indiana. Hinshaw, Gerald E., son, age 2 years 8 months, born in Indiana; parents born in Indiana. Hinshaw, Doroth E., daughter, age 11 months, born in Indiana; parents born in Indiana. Hinshaw, Earl, head-of-household, age 36, born in Indiana; parents born in Indiana; first married at age 21; rented home; no radio in home; occupation: farmer, general farm; not a veteran. Hinshaw, Clarice, wife, age 35, born in Indiana; father born in Ohio; mother born in Indiana; first married at age 20. Hinshaw, Frances, daughter, age 14, born in Indiana; parents born in Indiana; attended school. Hinshaw, Edgar, son, age 13, born in Indiana; parents born in Indiana; attended school. Hinshaw, Doris, daughter, age 10, born in Indiana; parents born in Indiana; attended school. Heinshaw, Earl, head-of-household, age 46, born in Indiana; completed 8th grade; on Apr 1 1935 was living in rural Randolph County, Indiana; owned [unclear] farm; $7950 value; occupation: farmer, farm. Heinshaw, Clarice, wife, age 46, born in Indiana; completed 8th grade; on Apr 1 1935 was living in rural Wayne County, Indiana. Heinshaw, Richard Keith, son, age 8, born in Indiana; completed 3rd grade; on Apr 1 1935 was living in rural Randolph County, Indiana; attended school. Heinshaw, Donald, son, age 5, born in Indiana; on Apr 1 1935 was living in rural Wayne County, Indiana. Mrs. Clarice Helen Hinshaw, 69 wife of Earl Hinshaw of Murray, died at her home. She had been in failing health for two years. A native of Randolph Co., Mrs. Hinshaw was born 09 Apr 1894, the daughter of David and Helena Phillips Rossa [sic]. Her marriage to Mr. Hinshaw took place 05 Apr 1914 in Winchester. Mrs. Hinshaw, a resident of Wells County 40 years, attended the Murray Missionary Church. Surviving in addition to the husband are two daughters, Mrs. Donald (Frances) Williams of Keystone and Mrs. Willard (Doris) Dale of Hagerstown; three sons, Gerald Edgar Hinshaw of Mishawaka and Richard K. and Donald P. Hinshaw, both of Bluffton Route 4, 19 grandchildren and five great-grandchildren. Burial was in the Oak Lawn Cemetery at Ossian. A retired farmer, Earl Hinshaw of Murray, 86, Bluffton Route 5, died 01 Dec 1979 at Clinic Hospital. Death due to a stroke, followed an illness of five weeks. Born 25 Apr 1893 in Randolph Co., he was the son of Elzey and Mary Ellen Robbins Hinshaw. 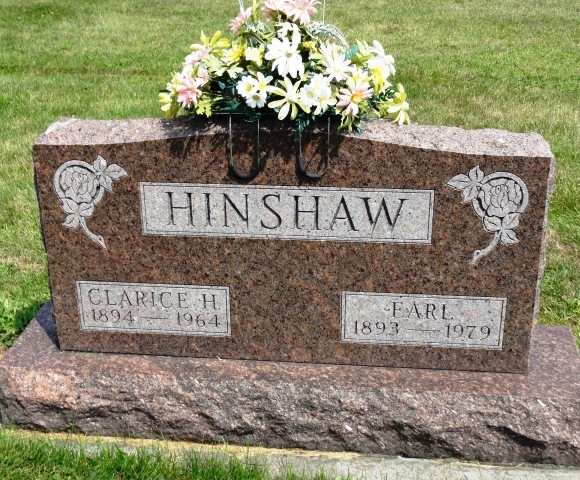 His marriage to Clarice Roosa, who died in 1964, took place April 9, 1914 in Randolph Co As a hobby, Mr. Hinshaw raised strawberries and raspberries for many years, and after his retirement cut and sold firewood. Surviving are two daughters, Mrs. Donald (Frances) Williams of Petrolem and Mrs. Willard (Doris) Dale of Hagerstown; three sons, Gerald E. Hinshaw of Houston, TX, and Richard Hinshaw and Donald Hinshaw, both of Bluffton Route 5, 19 grandchildren and 23 great-grandchildren. Burial was in Oak Lawn Cemetery at Ossian. Earl, the fourth son born to Elza and Mary E, Hinshaw was born April 25, 1893 and spent his boyhood days in the Snow Hill settlement. When he became a man he was married on April 5, 1915 to Clarice Roosa of Winchester, Indiana. They have a family of three fine children, Frances, Edgar and Doris. They live near Bluffton, Indiana. Indiana Work Projects Administration; book H-6, pg 2. 1940 census, Lancaster Township, Wells County, Indiana; roll T627-1110, ED 90-18, page 3B-4A, line #79, household #58. Obituary of Clarice Helen Roosa. Indiana Work Projects Administration; book H-2, pg 142.